The Napoleon Azure Vertical 38-inch electric fireplace is a stunning statement piece for any small or large area without the need for venting. Never sacrifice your personal style again by giving yourself ample choices! Customize your Azure Vertical 38-inch electric fireplace by choosing from one of three color settings, for not only the CRYSTALINE ember bed but the back lit NIGHT LIGHT as well. Enjoy the convenience of a Hang, Plug and Go fireplace or choose a recessed installation for a sleeker low-profile look. Whatever you do, make sure to sit back, relax, remote in hand and enjoy the memories around your new Azure Vertical 38 electric fireplace. This 50 inch Flat Glass Electric Fireplace offers cozy warmth and 3 colour flame with adjustable brightness to help you create the perfect mood for any setting. It can be installed by built-in, wall-mounted or free-standing. LED technology provides the most realistic flame effect. Flame effect can be used with or without heat for year-round enjoyment. 8-hour timer and overheat protection. Remote control included. Warm up your room and your dicor with the stunning 24 Daniel Curved Wall-Mount Electric Fireplace. Although small in size, the Daniel offers 4,500 BTU, enough to heat a 400ft room. Black tempered glass frames a realistic log set and flame effect. This unit includes a remote control and auto shut-off thermal protection for added safety and security. This wall mount includes an easy to install mounting system. Azure Vertical 38-inch Wall Mount Electric Fireplace The Napoleon Azure Vertical 38-inch electric fireplace is a stunning statement piece for any small or large area without the need for venting. Never sacrifice your personal style again by giving yourself ample choices! Customize your Azure Vertical 38-inch electric fireplace by choosing from one of three color settings, for not only the CRYSTALINE ember bed but the back lit NIGHT LIGHT as well. Enjoy the convenience of a Hang, Plug and Go fireplace or choose a recessed installation for a sleeker low-profile look. Whatever you do, make sure to sit back, relax, remote in hand and enjoy the memories around your new Azure Vertical 38 electric fireplace. Azure Vertical 38-inch Wall Mount Electric Fireplace is rated 4.7 out of 5 by 3. Rated 5 out of 5 by Revbonnie from Unique design for small spaces The vertical orientation of this fireplace plus its camouflaging cord cover make this a perfect choice for small spaces in apartments/condos. It looks more like a piece of wall art than anything else: great mood setter. Rated 5 out of 5 by DM Ken from Awesome Look Bought one of these for a 5 star suite and it looks incredible. Just bought 2 more for another project we're doing. Can the side accent lights be &quot;off&quot;, or do they always have to be set on a colour? Can the glass embers be set to &quot;off&quot; so they don't light up also? Thanks. Can the fireplace be mounted under a tv. The manual states that &quot;elevated temperatures on the wall or in the air above the appliance can cause melting, discoloration or damage to decorations, a T.V. or other electronic components&quot;. We do not recommend mounting the appliance under a TV however, you can review the installation manual for any clearance details listed. Yes, this Napoleon Azure Vertical fireplace has a built in and adjustable thermostat. The heat is designed to come out of the bottom of the unit. What is the minimum clearance around the unit? The NEFV38H requires a location that is not prone to moisture and is located at least 36&quot; (914mm) away from combustible materials such as curtain drapes, furniture, bedding, paper, etc. For further details, see page 9 of the owners manual. Is this unit only for wall or it can be on the floor also. Thank you. 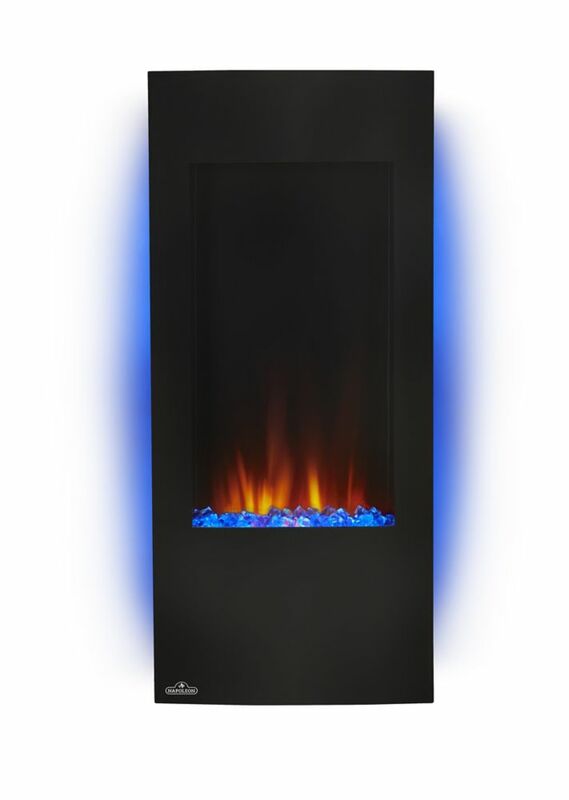 This Azure Vertical 38-inch fireplace is designed to be mounted on a wall.